Word Party Birthday Banner Personalized/Custom by MyBirthdayBanners at Nicky's Blog. Hurry! Limited time offer. Offer valid only while supplies last. 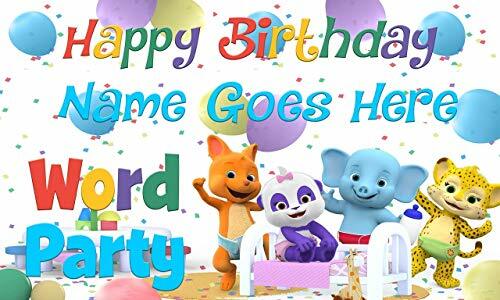 Word Party BIrthday Banner Personalized/Custom Printed on Glossy Vinyl at a High resolution. (No blurry images) Printed On Gloss Vinyl NOT PAPER. Send us the Information you would like to add to the banner. If you Would like to add a PHOTO YOU CAN. We will reply with a sample. One you approve the sample we will print and ship the Item Priority mail 2-3days. Any questions Message us at anytime. ***Copyright Notice** Please note that you are paying for a creative service and the time spent designing and personalizing your item with personal information and/or photos, which is permitted for one-time PERSONAL USE. This item is not a licensed product; all character images used are free and not being sold. We DO NOT SELL or claim ownership over the character clipart or graphics; they belong to their respective copyright holders. Items purchased are for one-time personal use only and are not to be re-sold for any reason. If you have any questions about this product by MyBirthdayBanners, contact us by completing and submitting the form below. If you are looking for a specif part number, please include it with your message.